You might think the Vice-Presidential debate concludes tonight. If you do, you’re mistaken. Democracy Now! is presenting the first Vice-Presidential Expanded Debate Friday morning (8-9AM EDT) and HuffPost Live will air a conversation between Third Party Vice-Presidential Candidates late Friday morning (11:30-noon EDT). 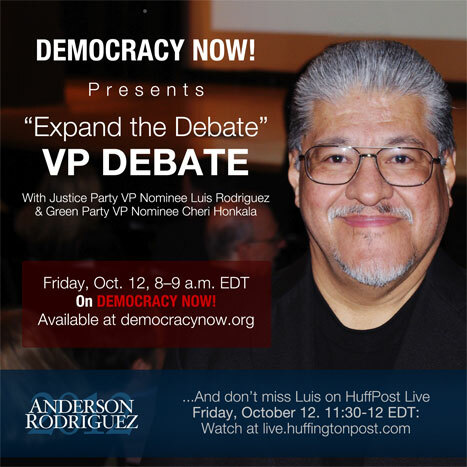 Luis Rodriguez (Justice Party) and Cheri Honkala (Green Party) will be responding to the same questions tomorrow morning on Democracy Now! that Joe Biden and Paul Ryan are responding to tonight. Following that, Rodriguez will be joined in the HuffPost Live discussion by Judge Jim Gray (Libertarian) and Ken Cross (Reform). Luis Rodriguez, a leading Chicano writer, speaker, gang expert and interventionist, and activist for justice in urban peace, the arts, labor, and human rights, is the 2012 Justice Party VP nominee. At just eleven, after his family resettled in the San Gabriel Valley, Luis joined his first street-gang. During the 60’s and early 70’s he was an active gang member — but he also began his work as a community organizer and major Chicano activist, participating in the Chicano Movement, the 1968 East L.A. walkouts, and the August 31, 1970 Chicano Moratorium against the Vietnam War. Facing a jail sentence for a criminal conviction, members of his community sent letters of support. In turn, Rodriguez quit drugs and the gang life, and dedicated his life to his people and their community. By 1980 Rodriguez had become a writer, publishing ChrismeArte, a Chicano art journal, and has since become a leading figure in contemporary Chicano literature. He has fifteen published books in poetry, fiction, non-fiction, and children’s literature, including the bestselling 1993 memoir Always Running: La Vida Loca, Gang Days in L.A. and its 2011 sequel, It Calls You Back: An Odyssey Through Love, Addiction, Revolutions, and Healing. After a life of working as an expert in gang intervention to keep young people out of gangs, Luis J. Rodriguez is running for the office of Vice-President of the United States, sharing the Justice Party ticket with former Salt Lake City Mayor Rocky Anderson. Unlike most Vice-Presidential candidates, Luis is not a lawyer, a Congressman, or a millionaire. He came from the streets and lived the life many impoverished minority young people live. He knows first hand what it is like to be a teenager with no hope. He also knows what it is like to beat the odds and succeed in the world of literature. He has been an inspiration to thousands of young Latinos and all Americans can use a dose of inspiration from Luis. Friday, October 12. 8–9 a.m. EDT: Democracy Now’s “Expanding the Debate” series continues, airing highlights from the “official” vice presidential debate with Joe Biden and Paul Ryan, with pauses to get responses from Green Party vice presidential nominee Cheri Honkala and Justice Party vice presidential nominee Luis Rodriguez. Friday, October 12. 11:30-12 EDT: Huffpost Live: “Conversation Between Third-Party VP Candidates,” featuring Justice Party Nominee Luis Rodriguez, Libertarian Nominee Judge Jim Gray, and Reform Party Nominee Ken Cross. Watch live or at any time after online at live.huffingtonpost.com. Wednesday, October 17. 8–9 a.m. EDT: Democracy Now’s “Expanding the Debate” series continues with highlights from the second presidential debate. Green Party nominee Jill Stein and Justice Party nominee Rocky Anderson will join Democracy Now! live on the show to offer responses to the same questions asked to President Obama and Mitt Romney. Monday, October 22. Time TBA: We continue our “Expanding the Debate” series with a live broadcast during the third presidential debate with real-time responses from Green Party presidential nominee Jill Stein and Justice Party nominee Rocky Anderson. Tuesday, October 23. 9 PM EDT: 2012 Free & Equal Presidential Debate in Chicago. 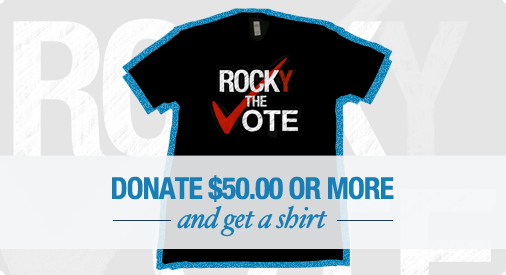 Rocky joins Gary Johnson, Jill Stein, and Virgil Goode to debate. Watch online at http://freeandequal.org (and other stations TBA).